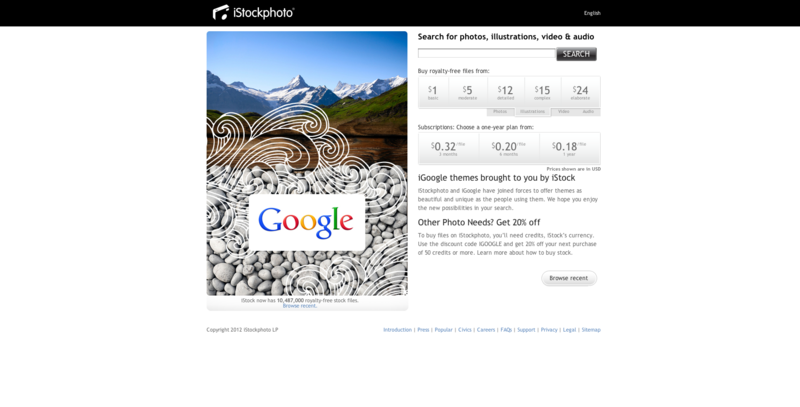 Singapore: March 6, 2012 — iStockphoto today announced a partnership with iGoogle to bring users a new selection of attractive, immersive full-page themes. In addition, iGoogle users will receive a 20-percent iStockphoto discount when they visit www.istockphoto.com/igoogle.php. In addition to adding gadgets for Gmail, news, photos, weather and more, users can now further personalize their iGoogle pages with background themes featuring iStockphoto, including their favourite themes from Gmail. iStock is the original microstock and is the web’s favored source for user-generated, royalty-free stock photos, illustrations, video, audio and Flash ™ and offers more than 10 million files. Offering the best search tools in the microstock industry, iStock makes it easy for people to find the perfect image quickly. The collection of new themes featuring iStock imagery is available globally and can be seen in the iGoogle theme directory. Favorite themes and gadgets can be shared on Google+ by clicking the +1 button. This entry was posted in Featured Photography Merchants, Photography Articles & Videos and tagged Getty Images, Google, iStock. Bookmark the permalink.